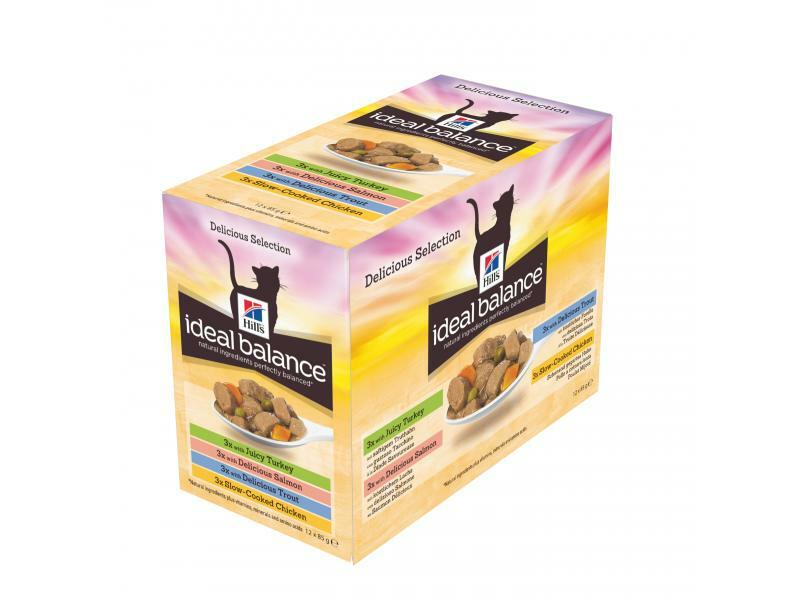 Delicious Hill’s Ideal Balance Feline Chunks in Gravy are made with finest natural ingredients and provide perfectly balanced nutrition for your cat’s overall health. 100% Balanced. 100% Taste. Guaranteed. Suitable for adult cats who are moderately active, from 1 year old until 7 years old. Chicken (26%), pork, animal protein powder, potato starch, rice starch, egg whites, dextrose, pea protein flour, pea fibre, oat fibre, minerals, brown rice, digest, carrots, chicken broth powder, spinach flakes, vitamins, taurine, trace elements and beta carotene. Coloured with natural caramel. Turkey (26%), pork, animal protein powder, potato starch, rice starch, egg whites, dextrose, oat fibre, pea protein flour, pea fibre, brown rice, minerals, digest, carrots, turkey broth powder, spinach flakes, vitamins, taurine, trace elements, DL-methionine and beta carotene. Coloured with natural caramel. Salmon (11%), pork, turkey, chicken, animal protein powder, egg whites, potato starch, rice starch, dried eggs, brown rice flour, dextrose, pea protein flour, pea fibre, oat fibre, brown rice, digest, minerals, carrots, chicken broth powder, spinach flakes, vitamins, taurine, trace elements, beta carotene, salmon meal, fish oil and turkey broth powder. Chicken Broth, Trout, Chicken, Carrots, Green Peas, Potatoes, Chicken Fat, Turkey, Egg White, Spinach, L-Lysine, Fish Oil, Choline Chloride, Dicalcium Phosphate, Calcium Chloride, DL-Methionine, vitamins (Vitamin E Supplement, Thiamine Mononitrate, Ascorbic Acid (source of vitamin C), Niacin Supplement, Menadione Sodium Bisulfite Complex (source of vitamin K), Pyridoxine Hydrochloride, Vitamin B12 Supplement, Pantothenic Acid, Riboflavin Supplement, Folic Acid , Biotin), Cranberry Pomace, minerals (Zinc Oxide, Ferrous Sulfate, Copper Sulfate, Manganese Sulfate, Calcium Iodate), Taurine, Beta-Carotene. These ranges are a starting point only, because cats' needs vary. Adjust the feeding amount to maintain optimal body weight. When feeding for the first time, mix increasing amounts of the pet’s new food with decreasing amounts of the previous food over a 7-day period. 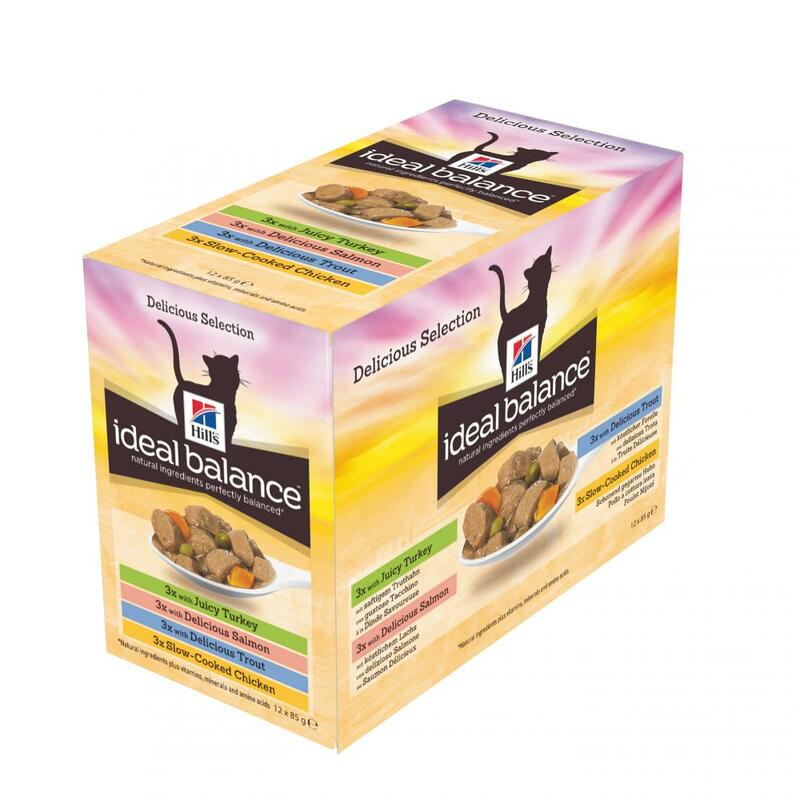 There are currently no questions for Hill's Ideal Balance Wet Cat Food - be the first to ask one!